As I write this, I realize that spring is a short 2 months away. But as much as the winter chill and shorter days can dull the mood; Christmas, New Year’s, and Valentine’s Day give plenty of reasons to celebrate during this season. Although our office is a little quieter during December, our staff quickly gets busy in January planning for a new year. There is always work to be done, and we look forward to accomplishing much in 2019 in the field of conservation. In the coming months, you can expect to see notifications about upcoming events, such as our annual tree sale. 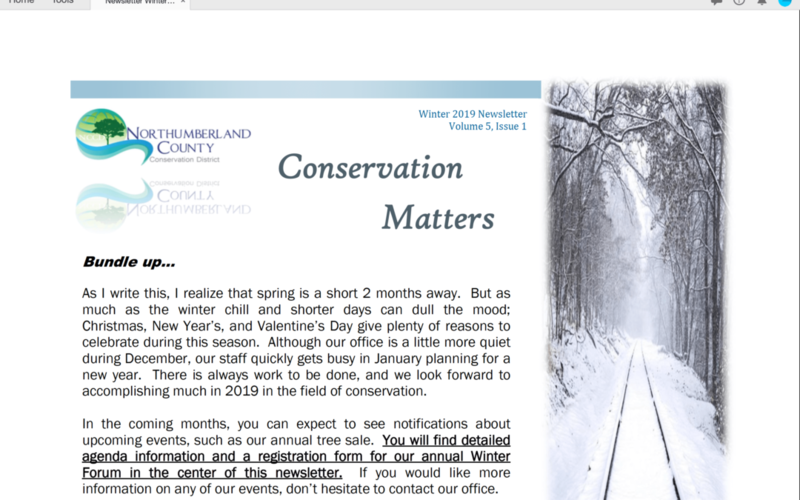 You will find detailed agenda information and a registration form for our annual Winter Forum in the center of this newsletter. If you would like more information on any of our events, don’t hesitate to contact our office.